The C-Class Sedan’s optional front seatbelts will tighten automatically in the event the vehicle detects an impending crash, improving protection against injury significantly. The A4 doesn’t offer pre-crash pretensioners. For enhanced safety, the front and rear seat shoulder belts of the Mercedes C-Class Sedan are height-adjustable to accommodate a wide variety of driver and passenger heights. A better fit can prevent injuries and the increased comfort also encourages passengers to buckle up. The Audi A4 has only front height-adjustable seat belts. The C-Class Sedan’s optional lane departure warning system alerts a temporarily inattentive driver when the vehicle begins to leave its lane and gently nudges the vehicle back towards its lane. The A4 doesn’t offer a lane departure warning system. The C-Class Sedan offers optional Parktronic™ to help warn the driver about vehicles, pedestrians or other obstacles behind or in front of their vehicle. The A4 doesn’t offer a front parking aid. The C-Class Sedan’s driver alert monitor detects an inattentive driver then sounds a warning and suggests a break. According to the NHTSA, drivers who fall asleep cause about 100,000 crashes and 1500 deaths a year. The A4 doesn’t offer a driver alert monitor. The C-Class Sedan has standard mbrace, which uses a global positioning satellite (GPS) receiver and a cellular system to get turn-by-turn driving directions, remotely unlock your doors if you lock your keys in, help track down your vehicle if it’s stolen or send emergency personnel to the scene if any airbags deploy. The A4 doesn’t offer a GPS response system, only a navigation computer with no live response for emergencies, so if you’re involved in an accident and you’re incapacitated help may not come as quickly. Both the C-Class Sedan and the A4 have standard driver and passenger frontal airbags, front side-impact airbags, side-impact head airbags, front and rear seatbelt pretensioners, height-adjustable front shoulder belts, plastic fuel tanks, traction control and electronic stability systems to prevent skidding. The C300 Sedan’s standard 3.5 DOHC V6 produces 28 more horsepower (248 vs. 220) than the A4’s 2.0 turbo 4 cyl. The C350 Sedan’s standard 3.5 DOHC V6 produces 82 more horsepower (302 vs. 220) and 15 lbs.-ft. more torque (273 vs. 258) than the A4’s 2.0 turbo 4 cyl. In heavy traffic or at stoplights the C300/C350 Sedan’s engine automatically turns off when the vehicle is stopped, saving fuel and reducing pollution. The engine is automatically restarted when the driver gets ready to move again. (Start/Stop isn’t accounted in present EPA fuel mileage tests.) The A4 doesn’t offer an automatic engine start/stop system. The C-Class Sedan has 1.3 gallons more fuel capacity than the A4 (17.4 vs. 16.1 gallons), for longer range between fill-ups. The C-Class Sedan’s standard front and rear disc brakes are vented to help dissipate heat for shorter stops with less fading. The rear discs on the A4 are solid, not vented. The C-Class Sedan has a standard continuously variable suspension system. Using sensors on steering angle, speed and other driver inputs, the shocks soften to improve ride, or stiffen when appropriate to aid handling on tricky roads. The A4’s suspension doesn’t offer adjustable shock absorbers. The C-Class Sedan’s front to rear weight distribution is more even (52.4% to 47.6%) than the A4’s (55.8% to 44.2%). This gives the C-Class Sedan more stable handling and braking. The C250 Sedan handles at .90 G’s, while the A4 2.0T Quattro pulls only .83 G’s of cornering force in a Car and Driver skidpad test. The C350 Sedan executes Motor Trend’s “Figure Eight” maneuver 1.5 seconds quicker than the A4 2.0T Quattro (26.1 seconds @ .71 average G’s vs. 27.6 seconds @ .62 average G’s). For better maneuverability, the C-Class Sedan’s turning circle is 2.4 feet tighter than the A4’s (35.3 feet vs. 37.7 feet). The C-Class Sedan is 4.3 inches shorter than the A4, making the C-Class Sedan easier to handle, maneuver and park in tight spaces. The design of the Mercedes C-Class Sedan amounts to more than styling. The C-Class Sedan has an aerodynamic coefficient of drag of .27 Cd. That is significantly lower than the A4 (.31) and many sports cars. A more efficient exterior helps keep the interior quieter and helps the C-Class Sedan get better fuel mileage. The C-Class Sedan has .2 inches more front headroom, .4 inches more front legroom and .7 inches more rear shoulder room than the A4. Unlike the driver-only memory seat and mirrors optional in the A4, the C-Class Sedan offers an optional driver and passenger memory, so that when drivers switch, the memory setting adjusts the driver’s seat, steering wheel position and outside mirror angle and the front passenger seat also adjusts to the new passenger’s preset preferences. The C-Class Sedan’s optional easy entry system raises the steering wheel when the door is unlocked or the ignition is switched off, making it easier for the driver to get in and out. The A4 doesn’t offer an easy entry system. If the windows are left down on the C-Class Sedan the driver can raise them all using the key in the outside lock cylinder or the keyless remote (remote must be aimed at door sensor); on a hot day the driver can lower the windows. The driver of the A4 can’t use the remote to operate the windows. Keyless-Go optional on the C-Class Sedan allows you to unlock the doors, trunk and start the engine all without removing a key from pocket or purse. This eliminates searching for keys before loading groceries, getting in the vehicle in bad weather or making a hurried start to your trip. The Audi A4’s available Audi Advanced Key doesn’t unlock the trunk. While driving with high beams on, sensitive light sensors available for the C-Class Sedan detect other vehicles which could be blinded and automatically switch to low beams. The A4 doesn’t offer automatic dimming high beams. To shield the driver and front passenger’s vision over a larger portion of the windshield and side windows, the C-Class Sedan has standard extendable sun visors. The A4 doesn’t offer extendable visors. The C-Class Sedan has a standard dual zone air conditioning allows the driver and front passenger to choose two completely different temperatures so people with different temperature preferences won’t have to compromise. This makes both the driver and front passenger as comfortable as possible. Dual zone air conditioning costs extra on the A4. Optional Mercedes-Benz Apps for the C-Class Sedan allows the driver and passengers access to select programs on their smartphones, including finding fuel prices at nearby service stations, searching the internet and other connected activities without taking their eyes off the road or their hands from the wheel. The A4 doesn’t offer factory integrated smartphone program access. According to The Car Book by Jack Gillis, the C-Class Sedan is less expensive to operate than the A4 because typical repairs cost less on the C-Class Sedan than the A4, including $83 less for a water pump, $13 less for front brake pads, $10 less for a starter and $133 less for fuel injection. 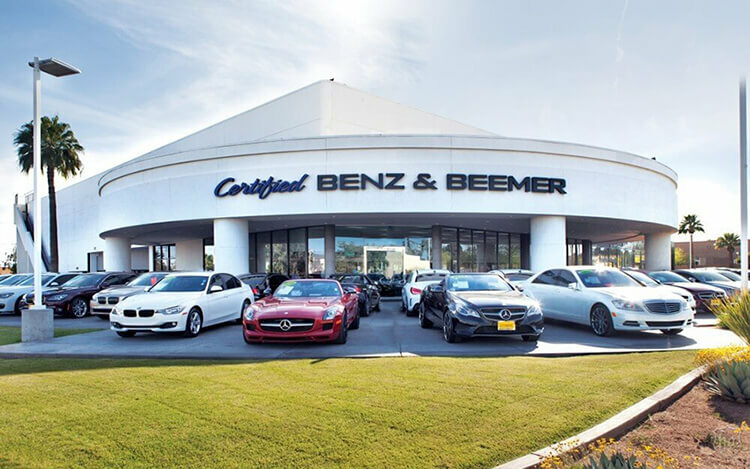 Consumer Reports® chose the Mercedes C-Class Sedan as its “Top Pick,” the highest scoring vehicle in its category, based on reliability, safety and performance. The Audi A4 isn't recommended. Motor Trend performed a comparison test in its May 2012 issue and they ranked the Mercedes C250 Sedan higher than the Audi A4 2.0T Quattro. The Mercedes C-Class outsold the Audi A4/S4 by over two to one during 2013.